Companies still rely on mission-critical applications running on their classic VAX, Alpha, HP 3000, and SPARC systems. As time goes on, the maintenance costs for these systems go up, and due to their age, reliability declines. Furthermore, these systems introduce risks to the business since they don’t fit within new disaster recovery paradigms, and the machines are at risk of data loss and excessive downtime in the case of an outage. But full migration or rewriting of these applications is an expensive, drawn-out, and risky proposition – and that’s where cross-platform server virtualization comes in. With Stromasys, you simply swap out your end-of-life classic hardware and move your entire software stack to the new virtualized environment – increasing performance, lowering cost, and reducing risk – all at once, and in a matter of days. Stromasys Cross-Platform Server Virtualization presents an alternative to full migration and searching for used parts: simply swap out your end-of-life classic hardware and move your software stack to a newly virtualized environment – increasing performance, lowering cost, and reducing risk. Stromasys has the ability to serve its clients globally with its products, services, and support that make virtualization not only easy and low-cost, but the smartest way forward. Designed to virtualize classic platforms, Charon™ from Stromasys presents a virtual replica of the original hardware system to the operating system. 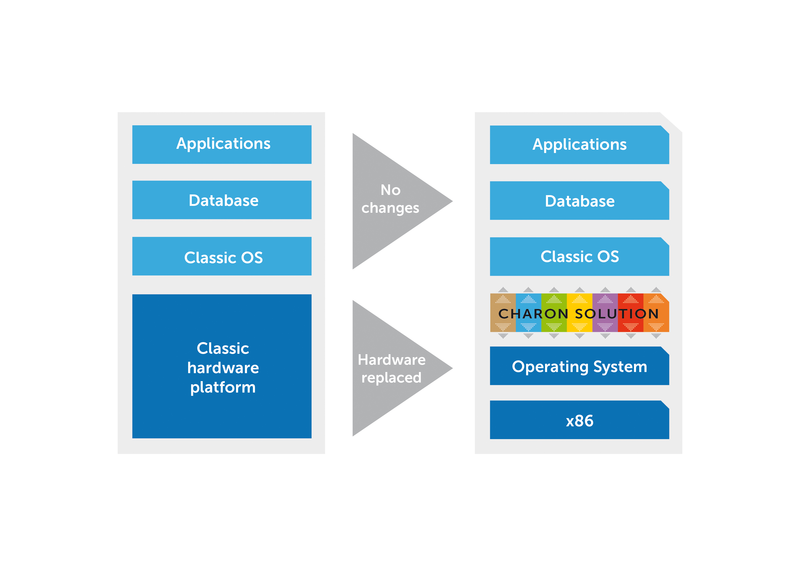 Charon runs the operating system and application software, including the original hardware diagnostics, in their existing form, while allowing you to replace aging hardware with new, modern equipment. Charon solutions reduce the maintenance costs and business risks typically applicable to classic applications. There is no application source code or conversion required. For more information, fill out the form on this page or return to stromasys.com homepage.